ALWAYS EARNED - NEVER GIVEN! 2019 Booster Club Registration is Live! 2019 Olathe South Falcon Football Booster Club Registration is now live! Please click on the Booster Club registration link from the left hand menu or click here. Please go to MY ACCOUNT tab to update personal information if you have registered on the site previously. To register for the 2019 Olathe South Football Season Booster Club, select the membership level you desire, and for your convenience use our online payment option. Team camp is June 13-15 at Missouri Western. Team Camp costs $170. 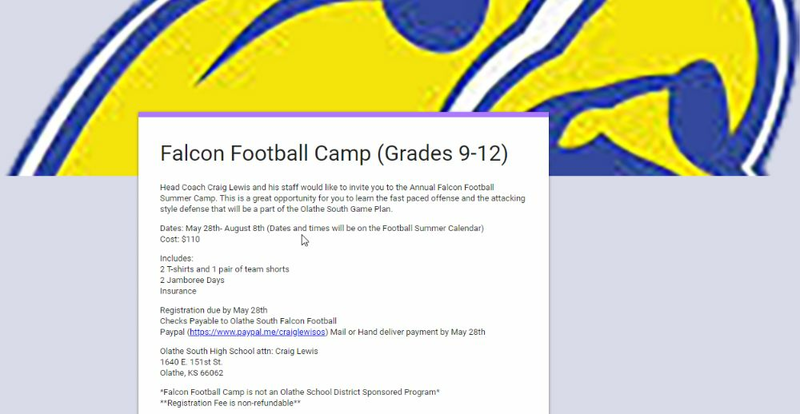 Head Coach Craig Lewis and his staff would like to invite you to the Annual Falcon Football Summer Camp. This is a great opportunity for you to learn the fast paced offense and the attacking style defense that will be a part of the Olathe South Game Plan.